Swiggy, an online food-ordering and delivery start-up, is owned and operated by Bundl Technologies Private Limited. They have reported their results for the FY 14-15 and they are not much different from other online food ordering startups. The company reported revenue of INR 11.6 lacs against a loss of INR 2.1 crores. The revenue from operations stood at INR 7 lacs. The revenue comprises the delivery fees charged to restaurants and ‘e-commerce revenue’. The biggest expense for the company was the employee expense at INR 1.3 crores. Swiggy mainly competes with Foodpanda, TinyOwl, Faaso’s and now Zomato, when it entered the food delivery segment last year. 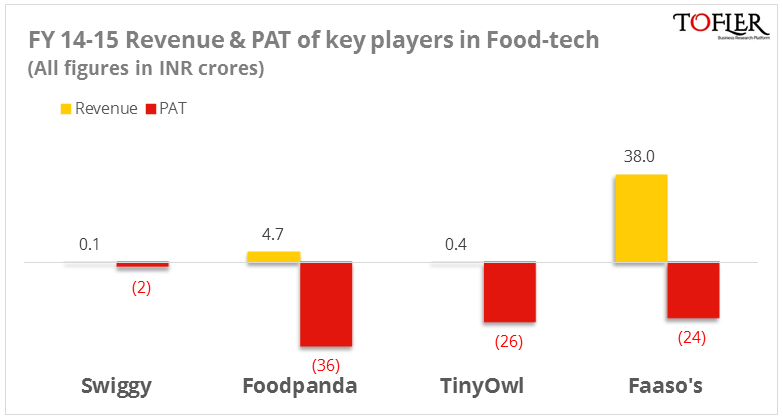 Following is a comparison of FY 14-15 revenue and PAT of ley players in food-tech. Zomato has not been included since it has primarily been a restaurant search and discovery platform and thus is not exactly comparable with the others. Swiggy was founded by Sriharsha Majety, Rahul Jaimini and Nandan Reddy in December, 2013 in Bengaluru and became operational in FY 14-15. It enlists restaurants from nearby location to the customers who can then select and place order through its app or the website. It has dedicated delivery personnel to pick up orders from restaurants and deliver them to the customers. Swiggy now has its operations in 8 cities across India. 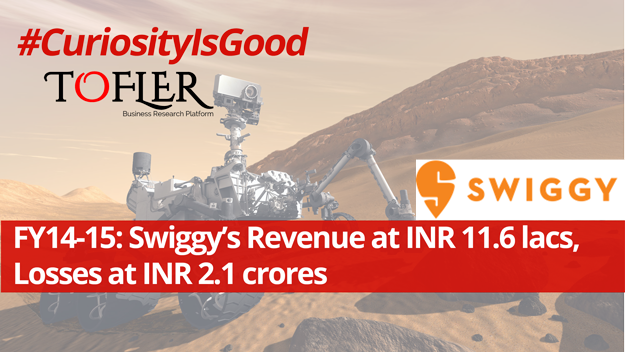 Swiggy secured its first funding from SAIF Partners in January 2015 followed by a funding round of INR 100 crores in June. The company has raised a total funding of INR 113.6 crores so far, from SAIF Partners, Accel, Norwest Venture and Apoletto Asia. 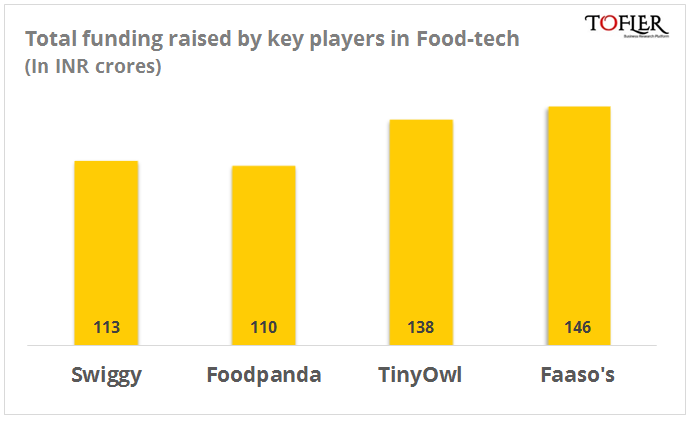 Here is a snapshot of total funding raised by Swiggy and its competitors in foodtech. With most of the players at almost similar stages, there is no clear leader so far in the online food ordering space. Although Zomato is way ahead of anyone in the restaurant search and discovery space, they have only just begun their food ordering operations. A few of the players such as Dazo, Spponjoy, etc. have already shut shop and there could be more such cases or industry consolidation. With heavy funding, this sector has already garnered everybody’s attention and it would be interesting to see how the space emerges.